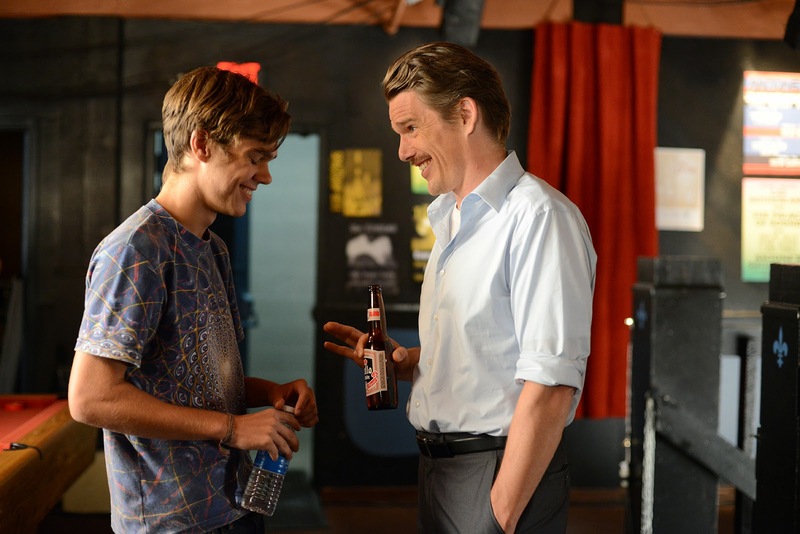 A fictional slice-of-life family drama filmed episodically over 12 years, Boyhood is an audacious attempt to meld the real passage of time into a movie narrative. At 6 years old, Mason Evans Jr. (Ellar Coltrane) is living with his mother Olivia (Patricia Arquette) and older sister Samantha (Lorelei Linklater) in Texas. Olivia and Mason Sr. (Ethan Hawke) are heading towards a divorce, with Mason Sr. now in Alaska but still doing his best to visit the kids and be an occasional Dad. Olivia moves the family to Houston where her mom Catherine (Libby Villari) can help look after the children while Olivia improves her education. With Mason at 9 years old, Olivia marries Bill (Marco Perella), one of her college teachers who has two kids of his own, and for a while the amalgamated family fortunes appear to be looking up. Mason Sr. continues to visit frequently and maintains a relationship with Mason and Samantha. When Mason is around 11, Bill's drinking spirals out of control and he evolves into a potentially violent alcoholic, forcing Olivia, Mason and Samantha to flee and start over. Olivia becomes a teacher, and as Mason reaches his teen years he develops an interest in photography, but his teacher Mr. Turlington (Tom McTigue) wonders if Mason has the necessary passion to succeed. Still ahead is yet another husband for Olivia, this time an Iraq war veteran (Brad Hawkins), as well as a new wife (Jenni Tooley) for dad, while Mason has his initial experiences with alcohol, drugs, and girls, including first serious girlfriend Sheena (Zoe Graham). An ordinary story presented in an extraordinary format, Boyhood places the passage of time at its core, with the events of life circling the flame of the passing years. Director Richard Linklater started working with his actors in 2002, and his 12 year project, condensed into just under three hours of screen time, is as much about the growth of the cast on camera as it is about the Evans family. The strength of the viewing experience resides in watching Arquette, Hawke, Coltrane and Lorelei Linklater age over more than a decade along with their characters. In the case of Ellar and Lorelei, the transformation straddles the massive inflection point between childhood and adulthood. But equally interesting are the changes experienced by Arquette and Hawke, forgoing makeup, surrendering to the ageing process and convincingly portraying parents grappling with the passage of time. The narrative itself is a fairly routine representation of familiar episodes from the life of a typically fractured family. The most dramatic event in Mason's life come courtesy of Olivia's second husband Bill losing his grip on reality and slipping into the destructive clutches of full-blown alcoholism. Otherwise the relative normalcy of what the Evans go through over 12 years adds to the blur between the reality of the ageing cast and the fictional narrative. The film is as much about parenthood as it is about boyhood. While Mason is the centre of the story from year to year, the gravitational pull is exerted by Olivia and Mason Sr. She steers the family through the various sub-strata of the middle class layer, her decisions mixing the good (back to school, securing a good job) with the bad (a real inability to pick suitable husbands). He is the departed father looking to re-balance his life, while still caring deeply about his children. The best moments in the film come whenever Mason Sr. has his turn with the children for a few days, and condenses his parental lessons to fit into the compact visits. Even when the scope is measured in years, it's still the small moments that matter the most. The relationship between Olivia and Mason Sr. is refreshingly free of melodrama, the initial tension of separation gradually replaced by tolerance and then maturing into something resembling friendship and ultimately growing respect. Both parents do the best that they know how, and the film's strongest arc grows out of the realization that they were unfortunately on different life frequencies, Mason Sr. gradually evolving into the perfect man for Olivia, but many years too late. The march of time defines the progression of life, including all its little ironies.